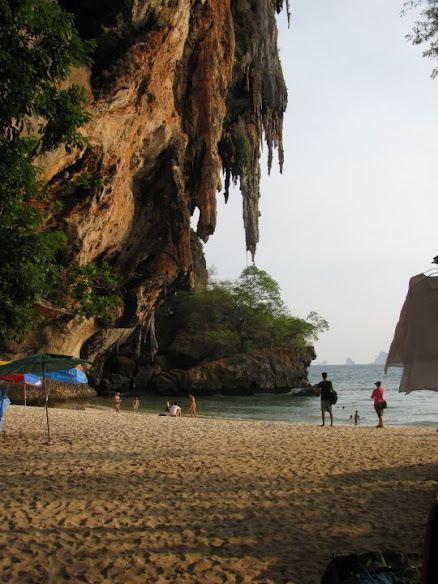 Railay Beach is known more for rock climbing, like what the guy in the picture above is doing, than for its beaches. But this beach was featured in seasons 1 of The Amazing Race and The Amazing Race: Asia, so I had to see it. We didn’t climb with King Climbers, the company used in The Amazing Race. Mark wanted to, but I’m afraid of heights and was only interested in swimming. 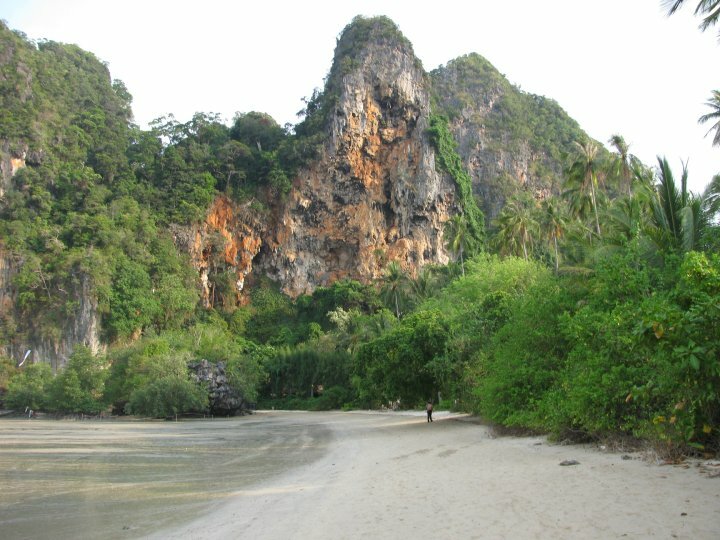 Besides, by the time we got to Railay Beach everything was closing up. We walked to the dock that was a block away from our hostel. Before we even got a boat or asked about boat prices, I did something that would save us from a lot of pain later on. I took a picture of a sign that has the name of our dock in English and in Thai. We were approached by one of the guys that were hanging out by the dock. He said that we could get a boat soon to Railay Beach, but we would have to wait for 6 more people. I thought that the 6 other people were on their way, but after waiting for half an hour, I realized that there were no such people. We where waiting for any 6 people and this could take forever. The dock guy started making small talk with us. Most of what he said didn’t make much sense, but he seemed quite happy about whatever his topic of conversation was. In the middle of one of his nonsensical ramblings he took out some leaves and started to roll a cigarette. “Do you know BIG cigarette? I like BIG cigarettes. I like marijuana, but no money. BIG cigarettes and big marijuana is good time!” He then proceeded to roll a ciggy with way too much tobacco in it to be closed. Just when I was beginning to worry that Mr. BIG cigarette was our driver to be, another guy told us that we could go now, if we paid 15,000THB. This was way too much. I told him that I would be willing to pay 700THB but nothing more. “That’s not half way,” I said. I began to think that maybe this guy also liked BIG cigarettes with marijuana and this was how he was able to afford them. Or maybe he said 12-thousand when he meant to say 12-hundred. Either way 7-hundred was all I planned to pay. The boat dropped us off at Railay Beach East. 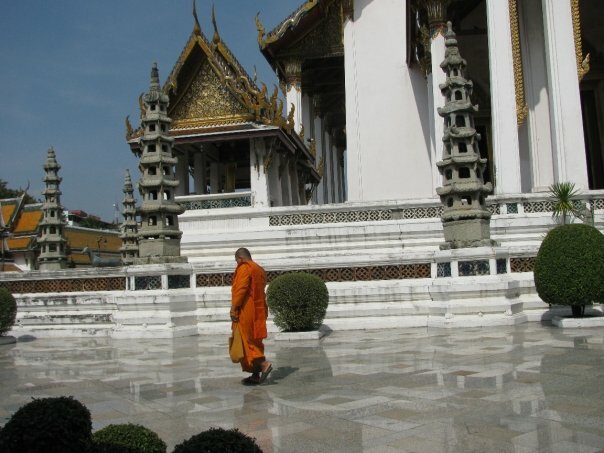 Then we walked to Phra Nang beach. Along the way we past a group of monkeys doing their thing. Soon after Mark found a banana salesman and got a bunch of bananas for the monkeys. They appreciated it very much. The rest of the afternoon was spent swimming and taking pictures. This beach was supposed to be a “secret”, but there were many people there. It wasn’t crowded, but it was no secret. It was a nice beach though; very nice. We were looking at the romantic sunset, when we notice all the boats leaving. We were able to get into the very last boat which was heading to Ao Nang (Nang Beach). This ride cost us 80THB each and got us very wet. We had dinner in Ao Nang and took a crazy motor bike ride back to our dock. I had a hard time explaining which dock we wanted. But then I remembered that I had taken a picture of it. I showed the driver the picture. Then he knew exactly where to take us. It will cost 200THB even though it’s a 20 minute ride. It’s a flat rate of 200THB to anywhere in Krabi Town. Give the taxi driver the address below. This is the Good Dream Guesthouse where we stayed. There is another one. 520 – 650 THB per night depending on the type of accommodations and length of stay. There are 2 Good Dream Guesthouses. If one is full, just ask about the other one. Getting here will cost 200THB. Just ask any of the people standing behind any desk. Just walk down to any of the docks (there are many) and begin exercising your negotiating skills. Normally it will cost you 150THB per person if you have about 6 people. If you have less, your skills will be put to the test. Just remember what dock you left from so you know which one to return to. There are also buses, but I don’t have information about them. Just from looking at the map, the bus might take a long time depending on where you are. There will be many places to buy hot food and cold drinks. Just walk down to any of the dock (there are many) and begin exercising your negotiating skills. 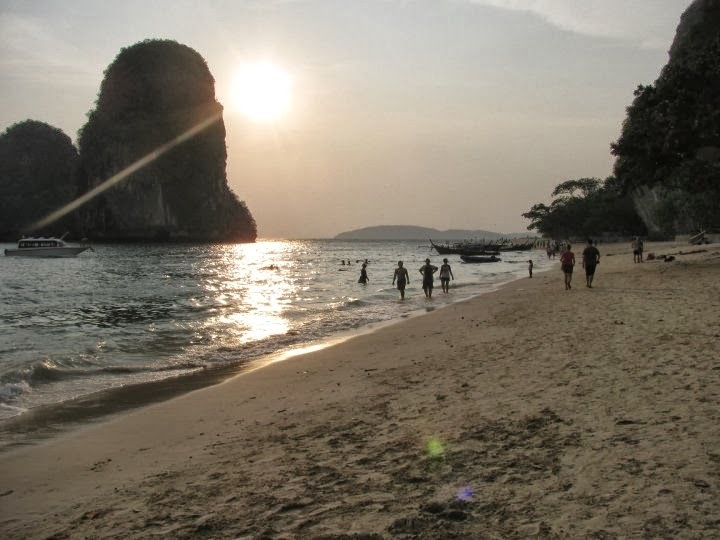 Find a path heading south and it will lead you right to Phra Nang Beach. If you can’t find the path, just walk into some resort. If you look like you don’t belong in any of the really expensive resorts in this area, someone will be sure to come along and “guide” you away from the premises while pointing you in the right direction. There is a really sketchy looking path that you can climb up to get a scenic view. If you continue on the path and head down you will see a lagoon, though I’m not sure if you are allowed to swim in it. From what I know about it, which isn’t much, the lagoon isn’t worth the tedious effort it takes to see it. There are a lot of monkeys that are not too shy around humans. They will steal from you. Keep shiny and delicious things inside your closed backpack or purse. If you are not staying on this island, make sure that you leave when all the boats do, or you will be stuck there.